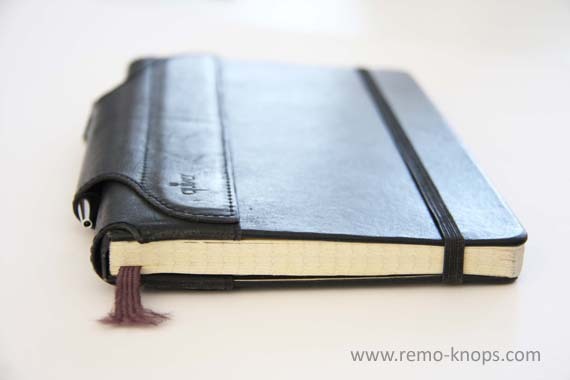 I’m a huge fan of the legendary Moleskine notebooks in this highly digital world. I always have a Moleskine in my Timbuk2 Custom Laptop Messenger Bag, because it allows me to write down ideas, create drawings, create visualizations of things I’m working on, or simply take notes. If you are a Moleskine user yourself, you might recognize the problem that it is hard to keep a pen and your Moleskine in one central place. When you want to use it, you need to search your pen, while clipping the pen onto the Moleskine isn’t a successful solution. Quiver – What’s in the name ? I think that Quiver is a great product name, where my Rotring- or Lamy pen is the metaphorically arrow in the definition above. An arrow also comes back as an element in the Quiver Global logo. Personally I think a good product name is as important as a good product. So let us have a closer look at Quiver single pen holder. In the picture above you can see a black Quiver single pen holder, installed on a Moleskine hardcover notebook of the metric size A5. You can directly notice that little thickness is added to the Moleskine notebook’s default height. The Lamy eco ballpoint is aligned with the backside of the Moleskine notebook. This is something I really like, when I pack a messenger bag and the Moleskine ends up between books or papers. An installation guide for both the single- and double Quiver pen holder is included with your order at Quiver Global. Installing the single Quiver pen holder requires five steps, however installation is so intuitive that it can hardly go wrong ! If you would like some help you can download a larger version of the Quiver pen holder installation guide in pdf-format. On the backside of the this installation guide you can find a promotional code for 5% discount as a returning customer ! The first step is to open the front cover of the Moleskine notebook and slide one side of the single Quiver pen holder over the cover. 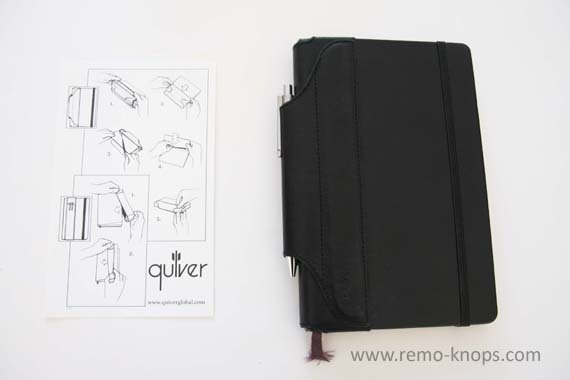 According to the installation guide is step two is sliding down the Quiver pen holder to the back of the notebook (as shown in the picture above). Step three of the installation guide is to open the back cover of the Moleskine notebook and pull the elastic insert over the back cover. 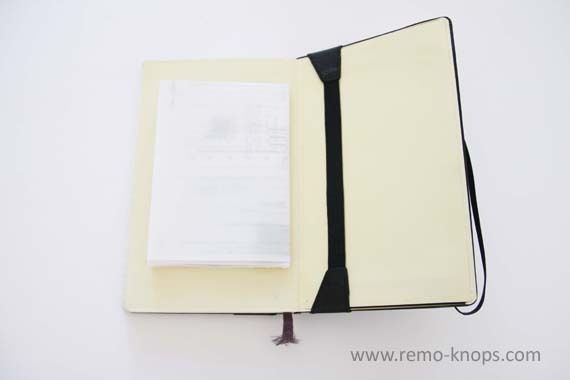 Step four is to slide it down to the back of the Moleskine notebook, as shown in the picture above. Step five is to equally distribute the Quiver pen holder over the front and back cover and make sure the Quiver is aligned with the Moleskine’s cover- and back-surface. You can clearly see in this picture how less of extra volume or thickness the Quiver pen holder adds to your Moleskine notebook. From this picture you might notice two layers in the Quiver pen holder. A first layer that wraps around the cover of the Moleskine notebook. 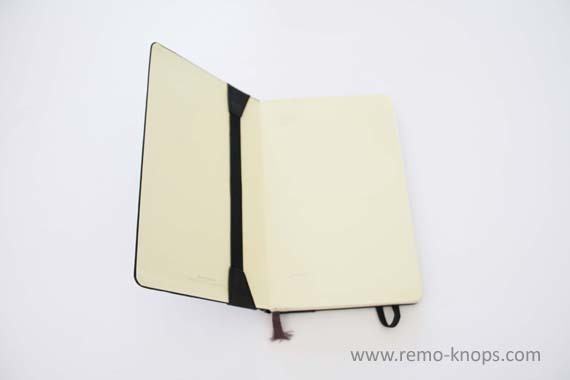 The second layer (on top of the first layer) features the steel insert and keeps the pen safe and secure at the back of the Moleskine notebook. Behind every great product is a company of clever entrepreneurial people. In this part of the article I will have a deeper look at the background of Quiver Global LLC and focus on some product development information. The three principals in Quiver Global are avid notebook users themselves, who decided to develop a pen holder as they were continually searching for a pen to make notes with. It was interesting the day that all three founders realized that each had his/her favorite pens but invariably didn’t have that particular pen with them when they needed to make a note or capture an idea in their notebooks/journals. Quiver was the result of that epiphany. Two partners are industrial design engineers. The Quiver products definitely show the great deal of thought and design expertise applied to this relatively simple product idea. An example of this artistry (my opinion), is the use of spring steel sewn into our single-pen products to ensure that the Quiver stays flat against the notebook’s front and back covers. This innovation adds to the attractiveness and functionality of the product we feel. Quiver experimented with various materials and design options for more than one year. Quiver furthermore hosted a number of customer focus group meetings beginning with friends and family members, then neighbors and finally serious notebook users to refine the initial product offering. Quiver Global furthermore worked closely with a manufacturing company (which specializes in leather products) to seek feedback and input into the types of fine leather, stitching material and manufacturing techniques that would provide our customers with many years of service. Quiver initially thought they would make a nice little product for one size notebook and in one color. But quickly realized with customer feedback that there were several notebook sizes, multiple pens and color leather that people were using and requested us to expand the product line. 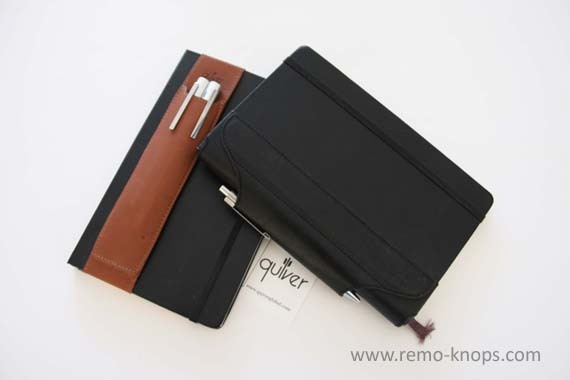 Quiver pen-holders for extra large notebooks, but which are used in combination with an Apple iPad as well ! Quiver continues to be pleased with the numerous ongoing customer suggestions as to different colored leather and materials that should likewise be explored for upcoming product releases. The Quiver pen holder for Moleskine made it almost instantly onto my favourite gear list. It is really funny how such a small accessory can make your life so much easier. No searching for pens anymore and no clipping pens on the cover, with the risc that your fountain pen is released from its cap. Information about Quiver product development, company background and their innovation approach made me even more enthusiastic. The Quiver pen holders are the result of a lot of thought, experimentation and feedback. 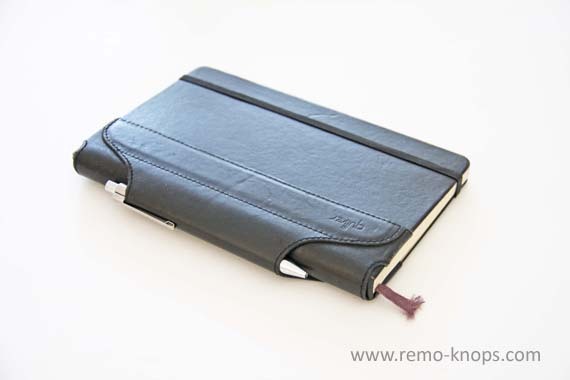 A leather Quiver pen holder for a single pen, which is shown in this article costs about € 20,- ! It is money well spend given the amount of innovation and detail. For every Moleskine user is the Quiver pen holder a must have accessory! Get your Quiver pen holder on the Quiver Global website. Thank you Remo for a wonderful product review. We’re delighted with our customer reception of our Quiver product line. With the able assistance of our customer fan base, we’ll keep innovating and broadening the product family. – Bob Koch, Co-founder, Quiver Global LLC. A great many thanks for your comment !! Also, take a look at Mojito Wallet. It pairs well with the Moleskine Pocket Notebook. The Quiver also works well on Rhodia notebooks! I have the 2-pen holder for my Moleskine Pocket Notebook and Single pen holder for the large one! I love the product not only for its function but also for its style value! Hey!, I found this information for you: "Quiver pen holder for Moleskine notebook". Here is the website link: https://www.remo-knops.com/2889/quiver-pen-holder-review/. Thank you.